PM Rudd's visit to Jakarta this week will almost certainly be marked up or down depending on the outcome of his talks with President SBY on the trafficking of asylum seekers from Indonesia to Australia. The issue is the latest high profile measure of the health of the Australia-Indonesia relationship. A potentially much bigger test, however, is just around the corner. Next year, Indonesians will elect a new president. Their choice will not only say a lot about the state of democracy in the world's fourth most populous country; it will also impact on the Australia-Indonesia relationship for better or for worse. The choice confronting the electorate is between what might be called Old Established Forces and New Emerging Forces, to borrow terms coined by Indonesia's founding president, Sukarno, in a former anti-colonial context. 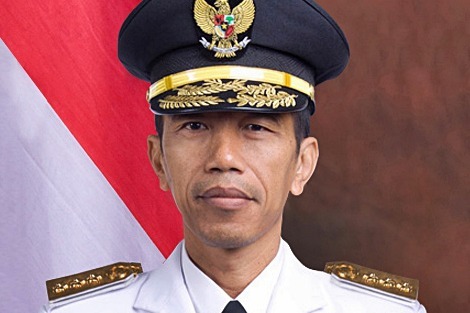 The final list of candidates is still to be settled, but the two individuals who most starkly represent Indonesia's past and its future are Prabowo Subianto, a former military commander, and Joko Widodo (pictured), a civilian being described in Jakarta as Indonesia's Obama. Suharto is dead, but he continues to make his presence felt. Posters in Central Java show a smiling Suharto teasing lebih enak jaman saya kan? (My time was nicer wasn't it?) and asking Indonesians how they are going. Many are said to pine for the days when, so the joke goes, 'You only needed to pay off one person to get things done'. His family recently opened a huge museum in his honour. It makes no mention of his crimes. Though he tries to re-brand himself as a champion of Java's populous rural poor, a massive reservoir of votes, Prabowo is unavoidably associated with the Suharto years. He is the former dictator's son-in-law, prosecuted the disastrous war in Timor-Leste on Suharto's behalf, has a questionable record in Papua, and is widely considered to be tarnished with the Suharto regime's bad human rights record. Prabowo has not been tried and found formally guilty of human rights violations. However, he is banned from the US for alleged involvement in torture and the organising of rapes during the upheaval in Jakarta at the end of the Suharto regime in 1998. And Timor-Leste's CAVR truth commission argued that he and fellow officers who had command responsibility in Timor-Leste during Indonesia's illegal occupation must be held accountable for the atrocities perpetrated against thousands of civilian victims there. Australia is not generally considered to be active in the struggle against impunity in the region but it does require visa applicants to declare whether or not they have been involved in human rights violations, war crimes or militia activity. Presumably, therefore, if Prabowo were to apply to visit Australia now or, heaven forbid, as president, Canberra would follow the US lead and deny him access or, very likely, have to endure the embarrassment of public protest in Australia where engagement with Timor-Leste is strong at all levels of society. Either way, Prabowo as president would almost certainly be a big headache for Australia and a potentially serious setback to our very important relationship with Indonesia reminiscent of the Suharto years. If Prabowo represents Indonesia's dark past that is best left behind, Widodo is a breath of fresh air who would be good news for both Indonesia and Australia. Popularly known as Jokowi, he has the exciting star quality of an Obama. My own informal poll of young and old Indonesians around Jakarta confirms the very positive ratings he enjoys in the professional polls. The former governor of Solo, he was elected governor of Jakarta last year and has distinguished himself particularly by his sensitive dealings with the masses of Indonesia's poor. It is not clear whether he will run next year or wait till 2019. My point is, however, that there are serious and attractive alternatives available to Indonesian voters who will do Indonesia proud at home and abroad. There are positive signs in addition to the enthusiasm for Jokowi. The widespread use of social media among young voters is one. The fact that SBY, having served the maximum two terms, cannot run again is another. It means that Indonesia has rejected the Suharto period model which allowed the former strongman to convert Indonesia into a dictatorship and rule for over 30 years. Contemporary polling indicates that many Indonesians regard democracy as the best system for Indonesia and consider Suharto was a dictator. The highly respected commentator Goenawan Mohamad observed recently that in the old days it was easy to blame Suharto for everything, but now Indonesians only have themselves to blame if they get it wrong. Australia should more than just hope and pray that they get it right next year. PM Rudd should use his visit to send a clear signal about Australia's hopes for human rights and democracy in Indonesia and that as a society we are pro-poor and no longer prepared to accommodate the impunity that was a hallmark of the Suharto years. Pat Walsh is currently visiting Jakarta. He co-founded Inside Indonesia magazine 30 years ago this year. Why does everyone whinge about asylum seekers who transit Indonesia and come here? It is their legal right and not our job to stop them or encourage the torture and abuse we are paying for. Thank you giving us some hope with this nicely written piece, Mr Walsh. Thanks Pat for a really informative article. It is so hard to get informed, reliable and thoughtful information about Indonesia in Australia. Our ignorance of our near neighbour is frightening. Anthony also has a point; we do need to confront the situation in West Papua. I'd love to know what Pat thinks of that. Hear, hear to Anthony and Paul. Indonesian rule in West Papua and that lline that divides the island of New Guinea into two are hangovers from the days of the Dutch East Indies. How is it that the alleged civilian candidate for the position of Indonesian president, in the photograph which you attached to your article is presented in full military uniform? "PM Rudd should use his visit to send a clear signal about Australia's hopes for human rights and democracy in Indonesia and that as a society we are pro-poor and no longer prepared to accommodate the impunity that was a hallmark of the Suharto years." Rudd should not say anything that appears to be interfering in Indonesian politics. He can say that Indonesia's transition to democracy is inspiring. He doesn't need to mention West Papua - SBY already knows what we think. My article does not comment on the Fretilin leader Mari Alkatiri's recent meeting with Prabowo in Jakarta. The encounter surprised and unsettled observers and drew a sharp rebuke from Indonesian and East Timorese NGOs. Was Timor-Leste using the meeting to position itself favourably should Prabowo win next year, or worse, give Prabowo its blessing? Or was the meeting part of Timor-Leste's long running effort to learn the whereabouts of the remains of Nicolau Lobato, the Fretilin President, who was tracked down, captured and killed by Prabowo's men in 1978? Hopefully Timor-Leste will clarify the situation. What drives the Labour Party's obsession with Indonesia? Before Balibo, as an Australian soldier in Malaysia in 1963-64 Soekarno sent Special Service commandos to attack Terandak near Malacca. This was the Army base for Kiwi, Brit and Oz troops AND their dependants. Soekarno picked a time when most were up near the Thai border hunting CT's. Blown off course their aircraft dropped them in the Muar jungle. My Regiment, 3RAR, had to rescue them. My daughters are still traumatised by their narrow escape. Then came Balibo. Ozzie journalists murdered by the Indonesia Army. Next in 1964-65 3RAR took them on in Borneo and gave them a "bloody nose". Finally came the East Timor "affair". The Whitlam government was well aware of the attempted genocide but held back. Why? It wasn't until 'little Johnny Howard' came along that something effective was done to save an independent people from Indonesia aggression, murder and the extensive use of torture. Today we are watching the same irreverence, murder and torture going on in West Irian, which ethnically, spiritually and in other ways is a unique and non- Indonesia people. A country more similar to Papua-New Guinea and once upon a time Australia's "political responsibility. Chris - re uniform: Indonesia was a Dutch colony, and inherited some European practices for its civil service incl the donning of civilian uniforms. Look at other countries in the region eg Thai civil servants and even Governors-General of Australia in early 20th century. Many on the left might shudder at the mention of Philip Ruddock or think that his views on migration control were extreme and 'illiberal'. But in fact his views rested on mainstream liberal ideas of limited freedom. In Australia the concepts offered by the liberal tradition have been employed by both sides of politics to give a 'reasonable' varnish to inhumane migration control policies.